Last week it was my son's 22nd Birthday.........wow, how time flies! Anyway, I thought I'd share with you all the card I made for him. This was a Copic/Coloured Pencil combo - I love using both mediums as it gives me the opportunity to get more detail into my images than pure Copic alone. Just remember to fix your work once completed as you are using pencils on very smooth cardstock and they will have a tendency to smudge - I use Winsor & Newton Professional Fixative, but hairspray will do the job too! 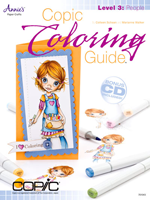 And remember, don't add your pencils until you have finished Copic colouring..........you don't want to clog your Copic nibs with pencil dust! 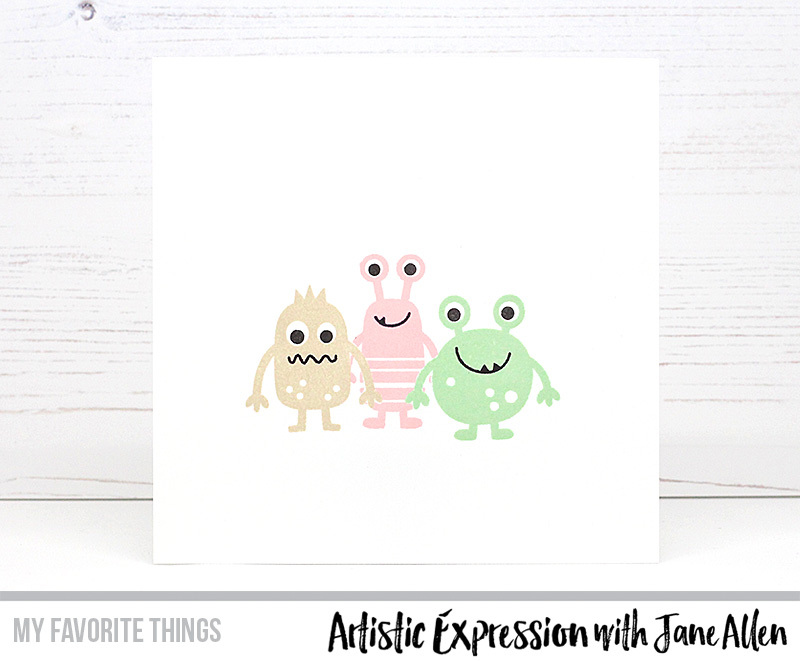 It's Wednesday again, so you know what that means - it's time for a new sketch on the My Favorite Things Challenge Blog. 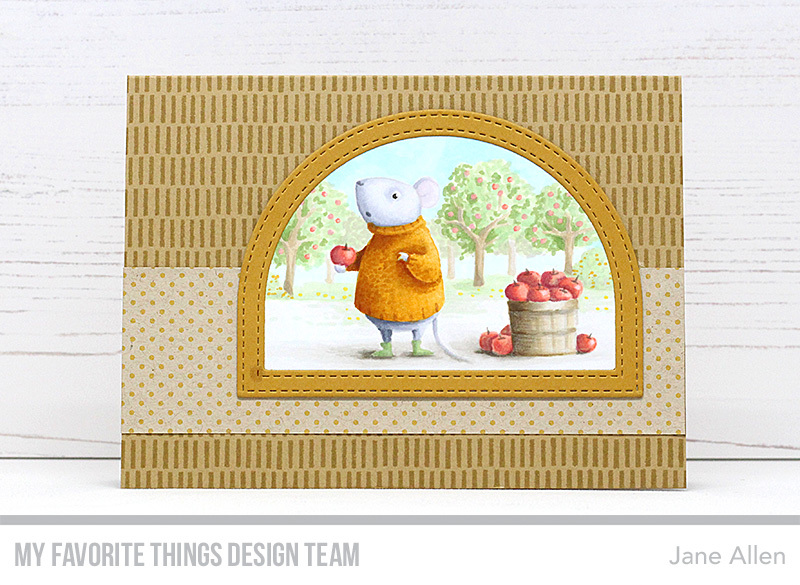 I don't know about you but I love autumnal colours and was inspired by the new Make your Mark background stamp that reminded me of a wicker basket..........which I thought would go well with the Harvest Mouse set. You know what comes next........yep, the Copic colours. So why not join in and you never know you could be the lucky winner of the $50 Gift Voucher! 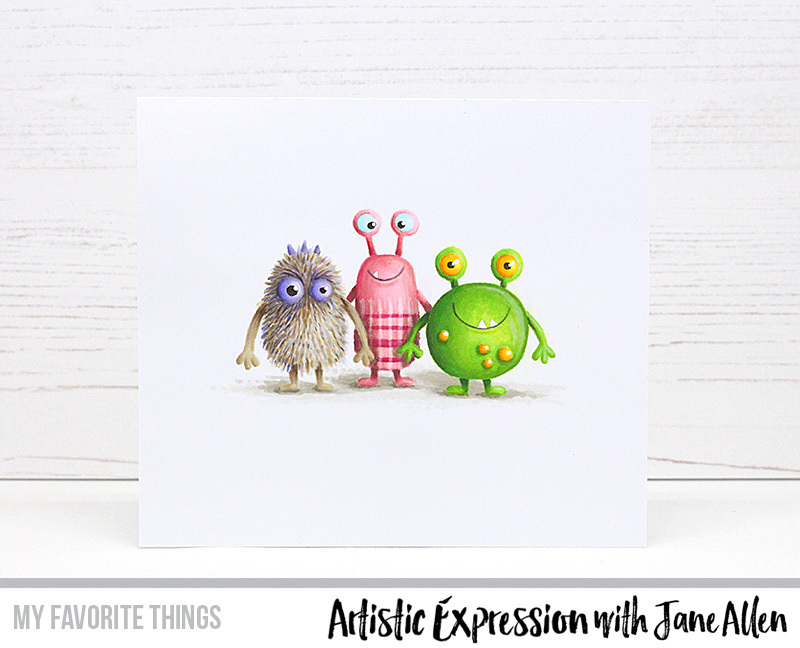 When your crafting mojo has gone walk about and you have that urge to create something but haven't got a clue where to start why not take a look at the Weekly Sketch Challenge at My Favorite Things - a new one is posted every Wednesday HERE. As you can see there is very little Copic colouring..........just the grey stripe and around the edge of the teeny weeny spider in the middle of the maze. 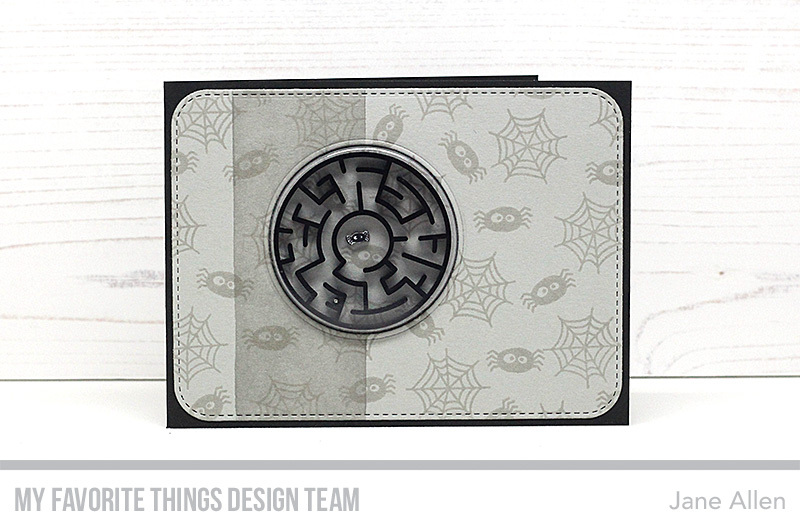 The spider/web background was created using the awesome Fab-BOO-lous Friends - I simply randomly stamped the web and spider images all over a pre-cut piece of Cement Gray card using Blueprints 31 with MFT Hybrid Cement Gray ink. Can you see the tiny spider in the centre, well he is actually the background spider stamped on to a piece of shrink plastic. I coloured him with black pencil, trimmed around him and then shrank him with a heat gun. Now, that stuff is a little hit and miss for me, sometimes I get great results and on occasions I've ended up with a blob of melted plastic - this time thankfully it worked! What do you think of the maze's we have in the store - cool aren't they and they fit inside our awesome round shaker pouches, so you don't have to mess around with acetate and foam tape. I opted for black but we have white and even a multi-colour pack. Now to cut out the circle I used the window part of the Circle Shaker Window and Frame die, but I omitted to cut out the frame - I wanted a much cleaner look for this card. Oh and the circle I cut out, well I fitted in the pouch, maze and ball bearing and then carefully replaced the circle, with the spider glued into the centre, mindful to line up the stamping - I then taped it all in place. And by the way no-one is too old for a maze card.......when I showed my husband what I'd created he sat there playing with it until he had got the little ball bearing into the middle & hit the spider!! Anyway, it's over to you guys - it's a really fun sketch this week! 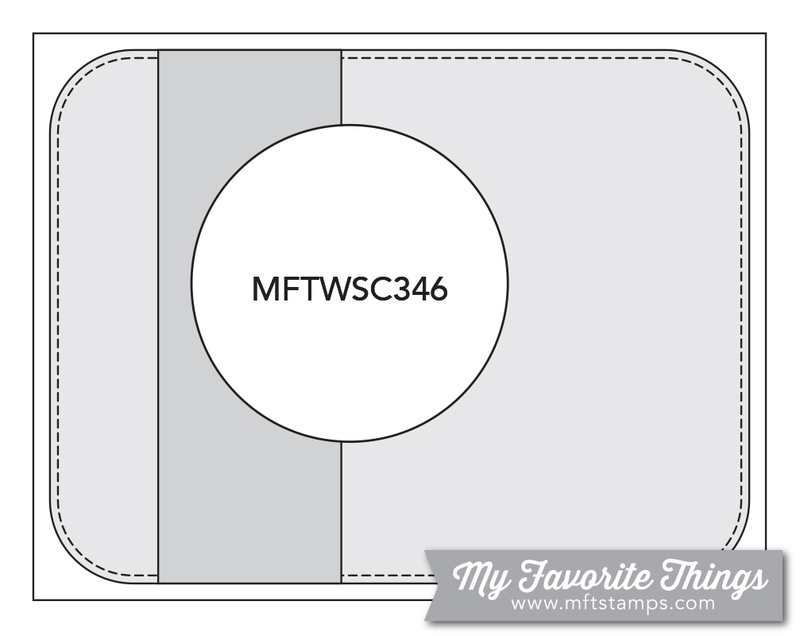 Have a go, you never know you may be the lucky winner and get a $50 voucher to spend in the MFT store! I thought I'd have a little bit of fun with this one, tee hee, I was certainly chuckling away whilst I was making it! As you will see when you read the supplies list, I got a tad carried away with this project - but having fun is what crafting is all about, isn't it! I don't know about you but I'm not sure if I'd want to go knocking on this particular door at Halloween..........I dread to think what is lurking at the letter box! 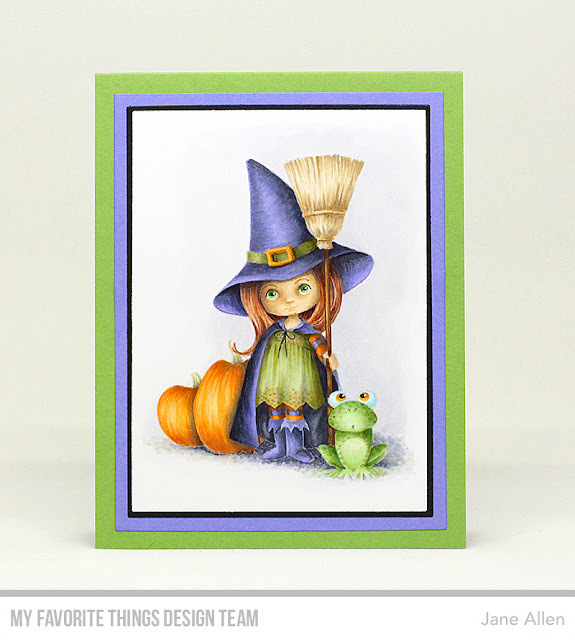 Would you like to know how I went about creating this card? I started with an A2 card cut from a piece of MFT After Midnight cardstock. The door panels were cut by fitting one stitched square die inside another, adhering them temporarily with tape and cutting them out of MFT After Midnight card. I then backed the top two squares with tracing paper to give the impression of glass panels. At this point I cut out squares in the top of the A2 card for the windows and also the letterbox. 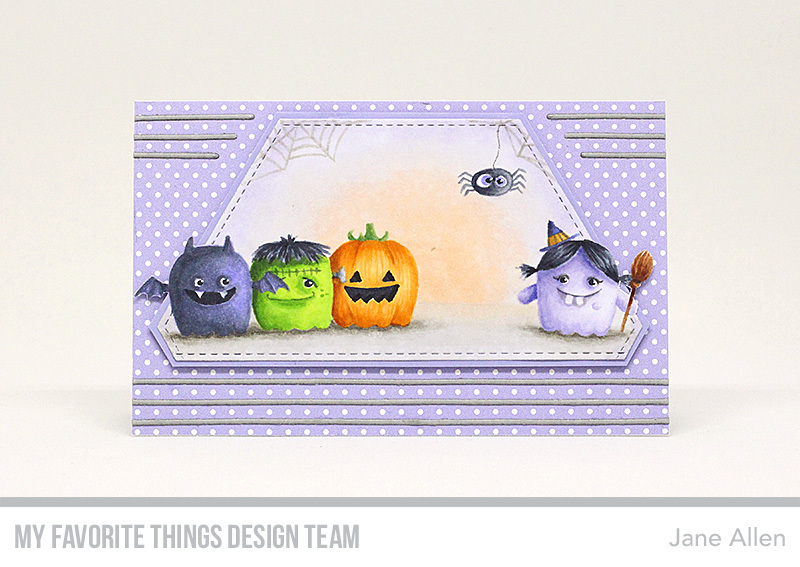 The cheeky little monsters were stamped in various shades MFT Hybrid ink on Copic suitable card. As with the Flamingo earlier in the week I coloured over the top with Copic markers.........I intend to go into more detail regarding this technique in my Artistic Expression Feature on the MFT Blog later this month. Once coloured, I cut them out carefully and adhered them to the back of the window panels. 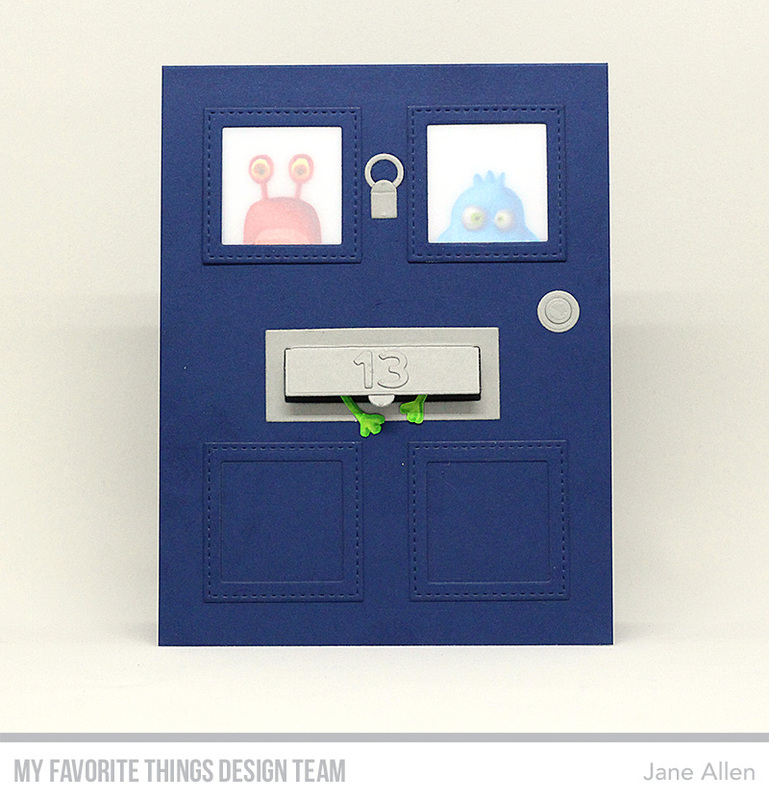 I used the new Mail Delivery die to create the letter box and added a pair of green arms and the number thirteen from the Confetti Numbers die. In order that the peeking monsters showed up I mounted a piece of white card to the back of the front panel, with a piece of black paper behind the letter box opening. The door knocker and handle were created using small dies from Stitched Tiny Tags and Surf and Turf. 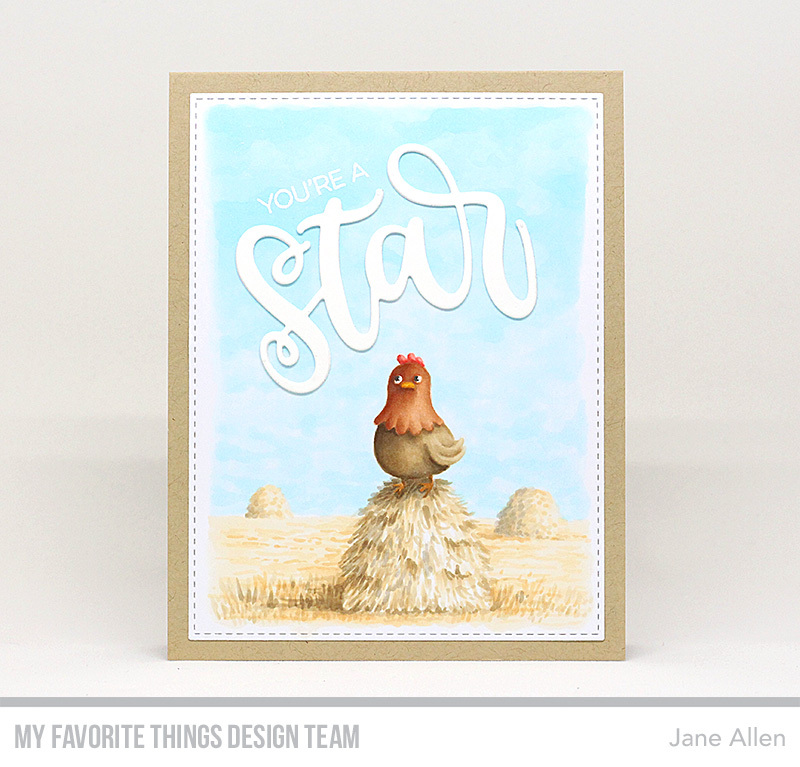 Whilst you're counting down the hours why not hop on over to the MFT Blog and see what my fellow Design Team members created today. Back later, with another project. Yesterday I showcased a realistic Flamingo........today, something completely different.....cute little Halloween characters from Birdie Brown! There are quite a few funny little characters in this set. I've just chosen four. Oops nearly forgot the goofy looking spider! For todays card I thought I'd have a bit of fun with some of our Die-Namics dies.........creating new shapes that fitted my composition - I used the largest Stitched Hexagon, then chopped off the bottom with one of the Stitched Basic Edges 2. I also opted to have some of my characters hanging over the edge of the die cut shape - you have to partially fussy cut these parts and make sure they sit above the die so they don't get chopped off when you run it through your die cutting machine. 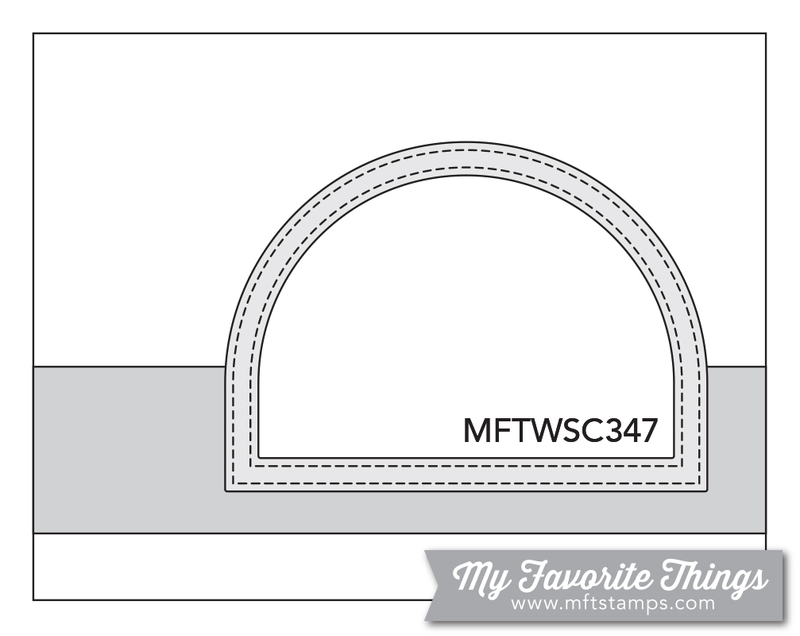 And those lovely thin lines of cardstock are courtesy of one of the dies from Bundle of Baby Clothes. I'll be back again soon with another countdown post. Any idea why I am tickled pink? 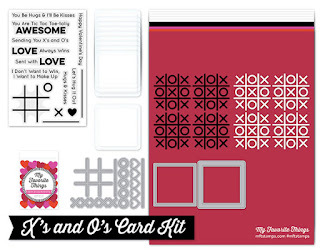 Well, in less than a week you will be able to get your crafty little paws on some awesome new My Favorite Things goodies! 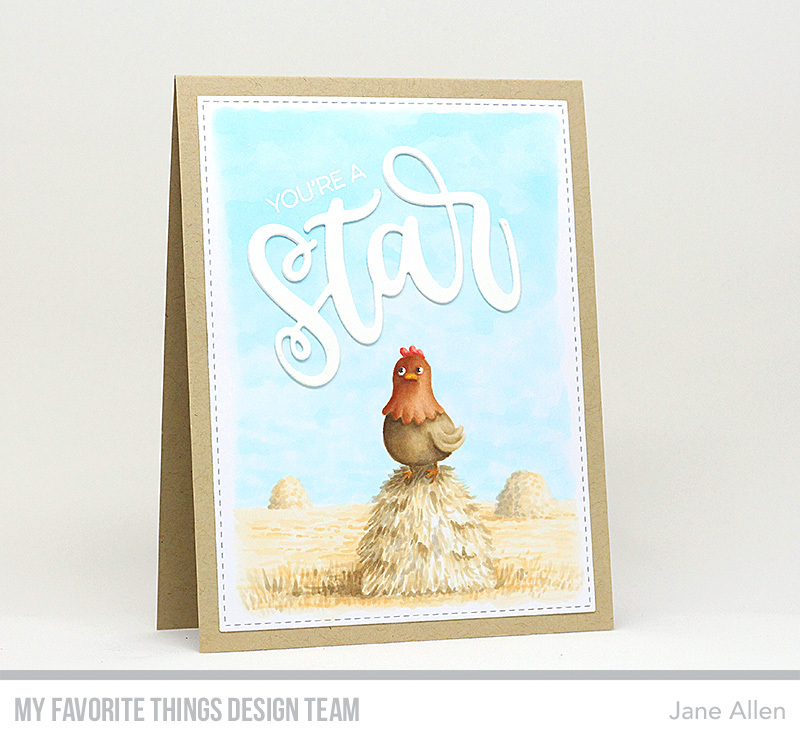 Today I am showcasing the new Flamazing Stamp set. 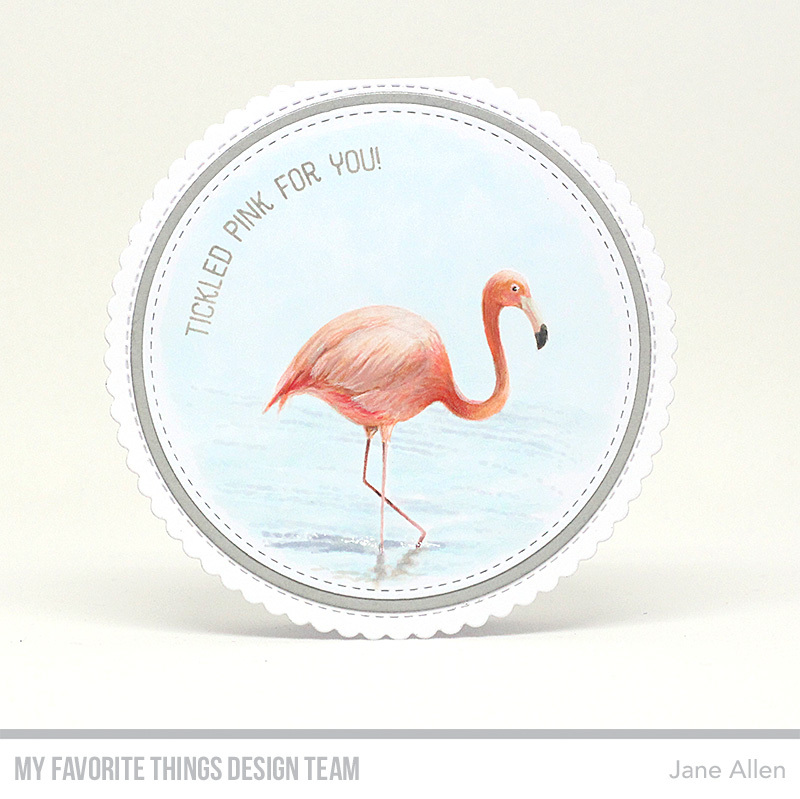 The stamp set itself enables you to stamp solid Flamingo images, but you know me by now, I like to think outside the box and used the stamp and some research via Google to give my example a more "realistic" look! Curious as to how I did it? Well, I initially stamped out the sections of the Flamingo in MFT Cement Grey Hybrid ink and then with several images of real life Flamingos for reference I started mapping in the various shades of pinks and greys with Copic marker over the top of the stamped image. 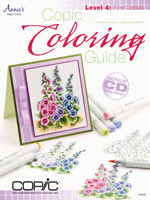 If you wish to try this yourself, please make sure you select a Copic suitable ink pad in a pale colour - I learnt the hard way that I should have chosen a pink hybrid ink........ho hum, next time! Once I felt I had gone as far as I could with the pens, I swapped over to pencils to add in the finer details and highlights, constantly referring back to the photographs. 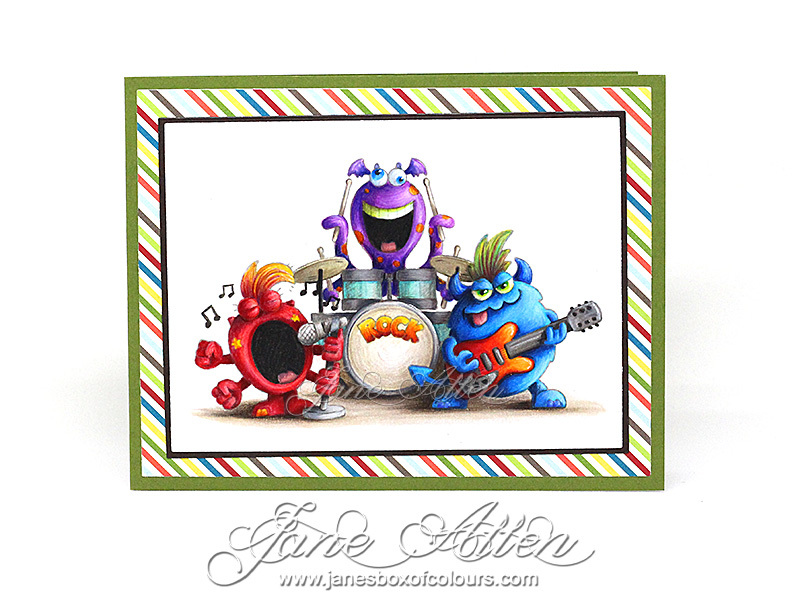 I stamped the sentiment on a curve to follow the shape of my circular card using my Misti, again with MFT Cement Grey Hybrid ink so that I could colour over the top of it with Copic marker without fear of it bleeding. 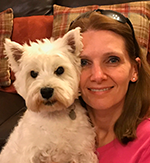 I'll be back soon with more Countdown fun!